Will Campbell, post-spring game. One week after the incident. 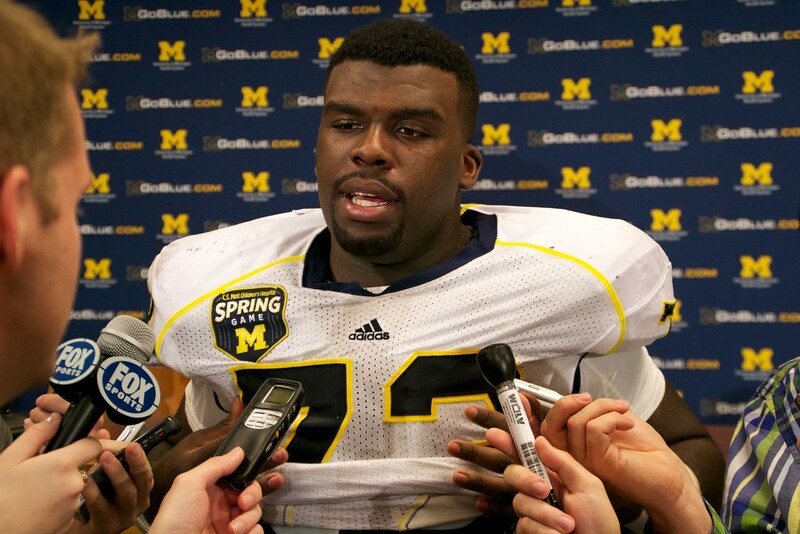 Michigan senior defensive tackle Will Campbell is facing one felony and one misdemeanor charge of malicious destruction of property stemming from an April 7 incident, according to court records. Records show Campbell was arraigned Thursday by a Washtenaw County magistrate on the felony charge — malicious destruction of property worth more than $1,000 but less than $20,000 — and misdemeanor charge — malicious destruction of property worth more than $200 but less than $1,000. He was given a $10,000 personal recognizance bond. According to Ann Arbor police, Campbell was arrested after attempting to slide across the hood of a vehicle at 2 a.m. on April 7 in the 600 block of Church Street. An officer in the area could hear the sheet metal on the hood of the car buckle under Campbell’s weight — he’s listed at 322 pounds — and arrested the senior, police stated. Campbell was intoxicated, according to police. Attempting to slide across the hood of a car. Emphasis on "attempting". Okay. Continue. Donald Payne, Campbell’s attorney, said the defensive tackle has never been in trouble in his life and the facts of the case will work out in his favor. Although he’s been charged with both a felony and a misdemeanor, Payne said it’s a misdemeanor at worst. Campbell will be back in court for a preliminary exam at 8:30 a.m. June 14, records show. While it's true, this is Campbell's first brush with the law, it's felony. And even for destruction of property, it's a pretty serious charge. If the charge gets knocked down to a misdemeanor, there will be hell to pay when he steps back on to the football field (assuming his status on the team is unaffected) from the coaching staff. And should he be not invited back, the depth situation on the interior defensive line goes from wherever it is now to DEFCON 1.